Irrigation water from many wells on the central coast contains a significant amount of nitrate-nitrogen (NO3-N); recycled water from the Monterey Regional Water Pollution Control Agency, the sole water source for approximately 12,000 acres of prime Monterey County farmland, is high in both NO3-N and NH4-N. Growers historically have been reluctant to modify their N fertilization practices on the basis of irrigation water N content because it is unclear how one can reliably calculate the ‘fertilizer value' of this N. This issue has taken on added significance with under the current ‘Ag Order' that was adopted by the Central Coast Region Water Quality Control Board in 2012. The Ag Order requires tier 2 and 3 growers who produce vegetable and berry crops to report the total amount of nitrogen applied to crop land, including N contained in irrigation water. Baseline numbers from the first two years of reporting on the Central Coast clearly showed that a majority of vegetable producers applied significantly more nitrogen than their crops took up. Water quality regulators would like growers to take proactive steps to reduce nitrogen inputs to their crops. One way many growers could make significant reductions in their use of fertilizer N is by off-setting their nitrogen fertilizer rates by a portion of the N applied through their irrigation water. The term “pump and fertilize” has been used to describe this practice because conceptually a grower is pumping water and using the water as fertilizer for the crop. The benefit for the grower is lower fertilizer costs, and the benefit for the environment is reducing nitrate loading to groundwater. In the Salinas Valley, the nitrate concentration of water pumped from agricultural wells averages more than 20 ppm N. This N concentration would translate to 37 lbs of N per acre for a lettuce crop receiving 8 inches of irrigation water. A significant number of wells have nitrate-N concentrations in the range of 30 to 50 ppm, and the amount of N that potentially could be applied to crops by irrigating with this water could be as high as 55 to 90 lbs per acre. Since most lettuce crops take up 130 to 150 lbs of N per acre, high nitrate water could substitute for one third to half of the fertilizer N normally needed to produce a crop. Despite the potential benefits of implementing “pump and fertilize,” adoption by growers has been slow. One reason is due to doubts that the nitrate in irrigation water is completely available to crops. Chemically speaking, nitrate in fertilizer and ground water are exactly the same. Nevertheless, growers are concerned that N concentrations in high nitrate water may still be too low to be absorbed by crop roots. Fertilizer N applications usually boosts the N concentration of the water in soil pores to levels much higher than are found in irrigation water. Another reason that growers are reluctant to account for the N in irrigation water is because they are uncertain about how much fertilizer credit to take when water is applied to leach salts that build up in the soil. Some growers have also expressed concern that the nitrates significantly increase the salinity of water, making it less beneficial to their crops. Finally, growers who use multiple wells to irrigate their fields have difficulty estimating the average N concentration of the irrigation water applied to their crops. Unfortunately, a limited body of research documents the efficiency of crop uptake of N from irrigation water upon which to base an estimate of ‘fertilizer value' under normal irrigation and N management practices. 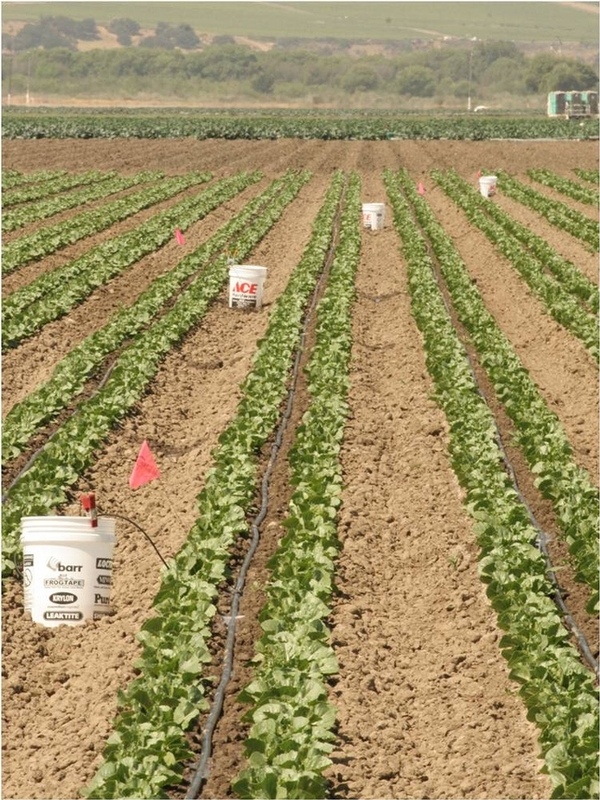 During the past 3 years we conducted replicated field trials to evaluate how much of the nitrate in irrigation water could be taken up by head lettuce (cv. Telluride) and broccoli (cv. Patron). Crops were seeded in two rows on 40-inch wide beds, and germinated with sprinklers. The only N applied at planting was from an anti-crustant application ranging from 17 to 22 lbs N/acre. Crops were drip irrigated after establishment using water of nitrate concentrations ranging from 2 to 44 ppm N. Water-powered injection pumps were used to enrich all drip applied water to target nitrate concentrations. Injected NO3-N was a blend of Ca(NO3)2 and NaNO3 to maintain the cation balance in the water. These water treatments were compared to an unfertilized control and standard fertilizer treatment (150 and 225 lbs N/acre AN20 for lettuce and broccoli, respectively). In addition, a water treatment dominated by NH4-N was included in the trials to simulate the N composition of recycled water. To observe the interaction of irrigation efficiency and crop nitrogen recovery, each N treatment was evaluated at two rates of applied water: 1. Standard water rate of 110% of crop ET 2. High water rate of 160% to 180% of crop ET, which corresponded to a 40% to 50% leaching fraction. A second set of field trials directly compared crop N recovery from irrigation water and fertilizer. Irrigation water with concentrations of 14, 25, and 44 ppm NO3-N were compared with fertigation applications of AN20 of seasonal totals equal to 0, 20, 60, and 150 lbs N/acre in lettuce and 0, 40, 80, and 200 lbs N/acre for broccoli. Note, that based on this equation applied N from the water treatments will increase as the amount of water applied and concentration of NO3 in the water increases. Results of the lettuce trial demonstrated that the concentration of nitrogen in the irrigation water significantly affected plant size, N content of tissue, biomass yield (data not presented) and confirmed that a significant portion of the N in the irrigation water was taken up by the crop (Fig. 1). The crop was able to utilize concentrations of NO3-N as low as 12 ppm in the irrigation water. Similar results were also observed in the broccoli trial (Fig. 2). As shown by the regression curves fit to the data, crop N uptake from irrigation water increased as the concentration of N in water increased. The fertilizer treatment (square symbols) indicated that crop N uptake would likely level off at high N concentrations. The N uptake from the water treatments in lettuce was similar for high and standard water rates, indicating that the volume of water applied did not affect the recovery of N (Fig. 1) and that all of the applied water could be credited as having N value for the crop. For broccoli, N uptake was lower under the high water rate (180% ET) than the standard water rate (110% ET). 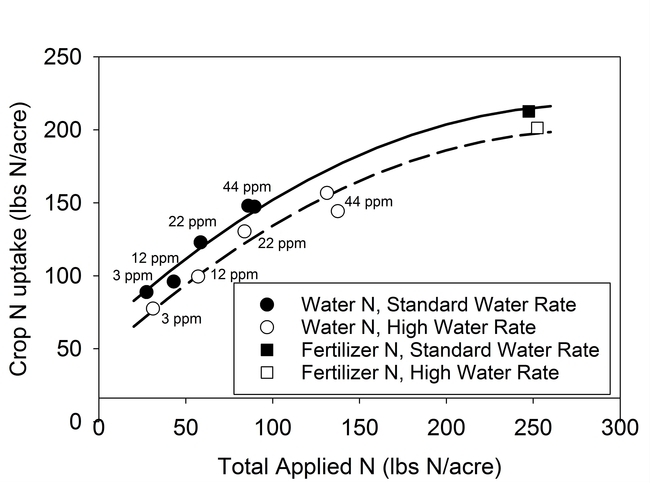 However, the recovery of N from the standard fertilizer treatment was also less under the high water rate (Fig. 2). Figure 2. N uptake by broccoli from water and fertilizer sources of N at standard (110% ET) and high water rates (180% ET). Symbols represent the mean N uptake of water and fertilizer treatments. N concentration of water treatments is displayed next to the symbols. 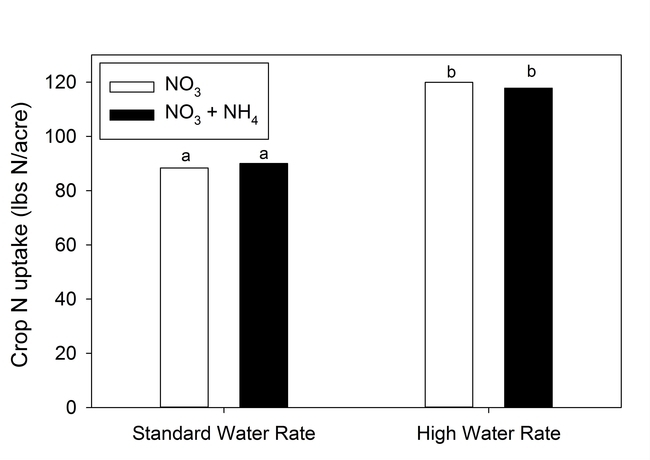 The source of N in the irrigation water (NH4 vs NO3) had no significant effect on N recovery by the crop (Fig. 3). Presumably under normal summer temperatures NH4 would quickly transform to NO3 when added to the soil. Nitrate did boost the salinity of water, but the amount was small: approximately 0.07 dS/m for each 10 ppm increase in Nitrate-N concentration. Hence, water with a 45 ppm NO3-N concentration would have a small boost in electrical conductivity equal to 0.31 dS/m. Figure 3. N uptake by lettuce from water with nitrate and ammonium sources of N at standard (110% ET) and high water rates (160% ET). The second set of trials confirmed that crop recovery of N from irrigation water and fertilizer was similar in lettuce (Fig. 4) and in broccoli (Fig. 5). 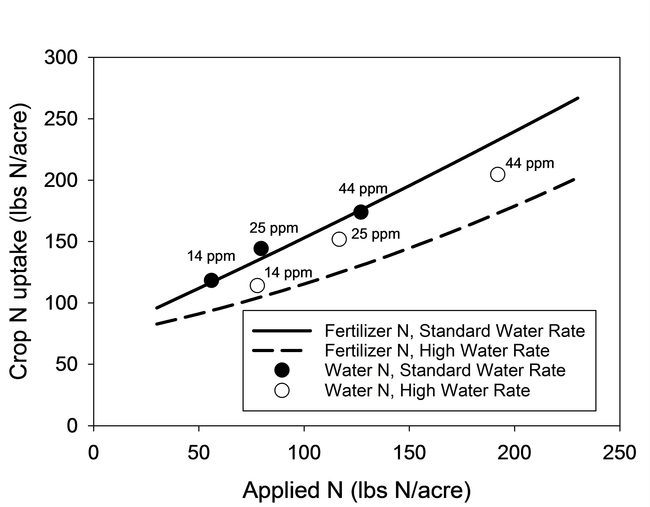 Symbols in both figures represent the mean N uptake response from the water treatments, and the regression curves were fit to the N uptake response to the fertilizer treatments. The observation that crop N uptake of most water treatments was equal to or greater than values represented by the regression line demonstrated that crop recovery of N from irrigation water was equal to or greater than from fertilizer. Similar to the previous trials, crops were able to recover N from water with concentrations of nitrate as low as 14 ppm N. N recovery was similar under high and standard water rates for lettuce but as found in the earlier trial with broccoli, crop N recovery declined for both the fertilizer and the water sources of N under the high water rate (Fig. 5). Figure 4. N uptake by lettuce from water and fertilizer sources of N at standard (110% ET) and high water rates (170% ET). Regression lines represent N uptake response to fertilizer treatments. Symbols represent average N uptake from water treatments. N concentration of water treatments is displayed next to the symbols. Figure 5. N uptake by broccoli from water and fertilizer sources of N at standard (110% ET) and high water (180% ET) rates. Regression lines represent N uptake response to fertilizer treatments. Symbols represent average N uptake from water treatments. N concentration of water treatments is displayed next to the symbols. The results of these field trials demonstrated that N in irrigation water has fertilizer value for both shallow (lettuce) and deep (broccoli) rooted vegetables, even when the N concentration in the water was low (12 to 14 ppm N). The trials also showed that the volume of water applied did not affect the crop recovery rate of N from water more than from fertilizer, suggesting that it is reasonable to credit all the N applied in water as having fertilizer value to the crop. These results were attained under well-managed drip irrigation with a high application uniformity and frequent irrigations so that irrigation volumes were small, which likely minimized leaching losses of any single irrigation event. It is possible that under poor water management or less efficient irrigation methods (eg. furrow), recovery of N would be less than was reported in these trials. Although the results of these experimental trials confirmed that growers can confidently take credit for background levels of nitrate in the irrigation water, one should still be cautious when implementing this practice. Experimenting on fields where the water source is known to have a consistently high concentration of nitrate but is not excessively high in salts is recommended. Drip provides better control of irrigation volumes than sprinklers and furrow systems, which may minimize excessive leaching, and also offer more opportunities for fertigating N to correct observed deficiencies. Because the crop water use is low during the first weeks after planting, it is also reasonable to wait until after establishment to take credit for the nitrogen applied in irrigation water. Soil nitrate levels should be monitored after crop establishment to determine if the soil has a sufficient supply of N. If using multiple water sources for a crop, the nitrate concentration of the blended water needs to be determined in samples collected at the field. Finally, applied water volumes need to be accurately monitored to estimate the amount of N that was applied through the irrigation water. With water quality regulations continuing to become stricter for agriculture, it makes sense for growers to start implementing practices that can both lower farming costs and are beneficial for the environment. 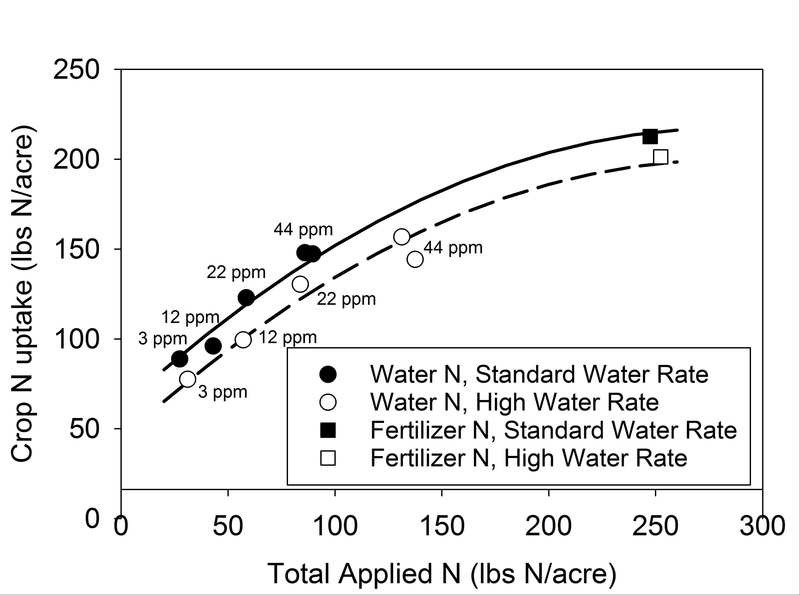 By accounting for the nitrate in irrigation water and using the soil nitrate quick test to monitor soil N levels, growers may be able to make significant progress in reducing the amount of fertilizer nitrogen needed to produce their crops, and demonstrate that they are addressing water quality concerns. We thank Sharon Benzen and David Lara of the USDA-ARS in Salinas, CA for assistance with the field trials. This project was funded by a grant from the California Department of Food and Agriculture's Fertilizer Research and Education Program (FREP) and the Fertilizer Inspection Advisory Board. Does nitrate make your irrigation water saltier? The short answer is not very much (unless you are fertigating). Nitrate-N concentrations in most agricultural wells on the Central Coast range from 2 to 50 ppm. Some wells do have background levels of NO3-N as high as 70 ppm but these concentrations are uncommon. We used an electrical conductivity (EC) meter to measure the change in salinity of well water after adding different concentrations of nitrate salts. The well water tested in our study was highly suitable for vegetable production: the EC was 0.5 dS/m and the background concentration of nitrate was 3 ppm NO3-N. We added sodium- and calcium-nitrate salts to the water to achieve concentrations of nitrate ranging from 3 to 42 ppm N.
Figure 1 shows the effect of nitrate concentration on salinity of the water. The salt content of the water did increase with increasing concentrations of NO3-N, but increases in salinity were modest. For each increase of 10 ppm NO3-N, the EC of the water was raised by 0.07 dS/m. 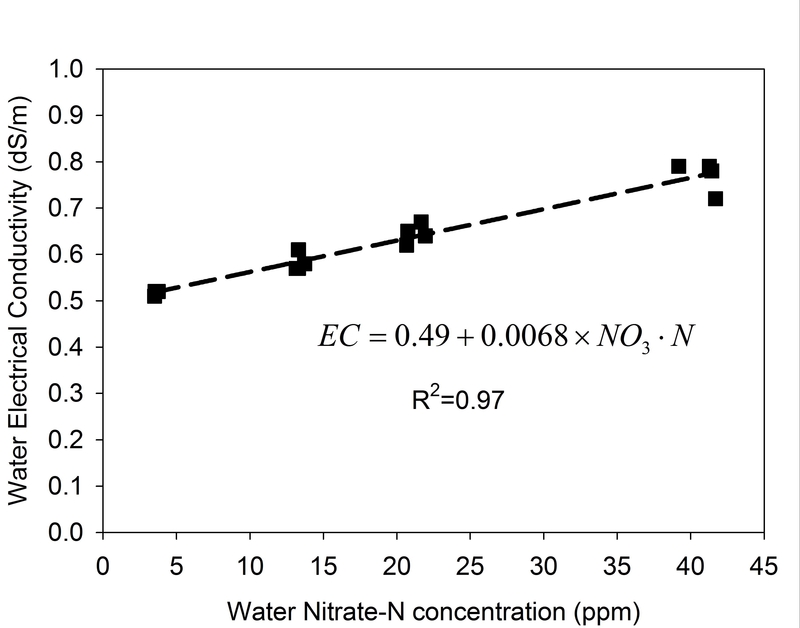 At the highest NO3-N concentration evaluated (42 ppm N) the corresponding EC of the water averaged 0.77 dS/m, or a boost in salinity of 0.27 dS/m. Even at the highest nitrate concentration, the water that we tested was still very suitable for producing cool season vegetables and strawberries without causing yield loss. Figure 1. Nitrate concentration effects on salinity of water. A high concentration of nitrates in irrigation water can also supply a significant portion of the nitrogen needs of a crop. Irrigation water with an NO3-N concentration of 42 ppm would supply approximately 9.5 lbs of N/acre for each inch of water applied, or about 77 lbs of N/acre for a lettuce crop if 8 inches of water were applied during the season. Some growers have observed that their high nitrate wells are problematic for producing good vegetable crops, and have remarked that high nitrate water tends to be salty. This study demonstrated that nitrate is probably not the cause of the salinity, unless the nitrate concentrations are very high (> 100 ppm N). Well water can have a high salt content for a variety of reasons. Underground aquifers derived from marine sediments can contain salts that increase the salinity of groundwater. Near the coast, wells can become salty if seawater intrudes into ground water. Another source of salts is from irrigation water. Approximately 1 ton of salts are contained in an acre-foot of water that has an EC of 1.15 dS/m. As crops transpire moisture, salts accumulate in the soil, and will eventually leach deeper in the soil profile as more irrigation water is applied. Over time, leached salts could eventually reach the ground water, and increase the salinity level of the water. In conclusion, nitrates in irrigation water are unlikely to be a significant cause of salinity of ground water. If your well water has a high concentration of nitrates and also has a high EC (> 1 dS/m), a water suitability test may reveal other salts contributing to the salinity of the water. 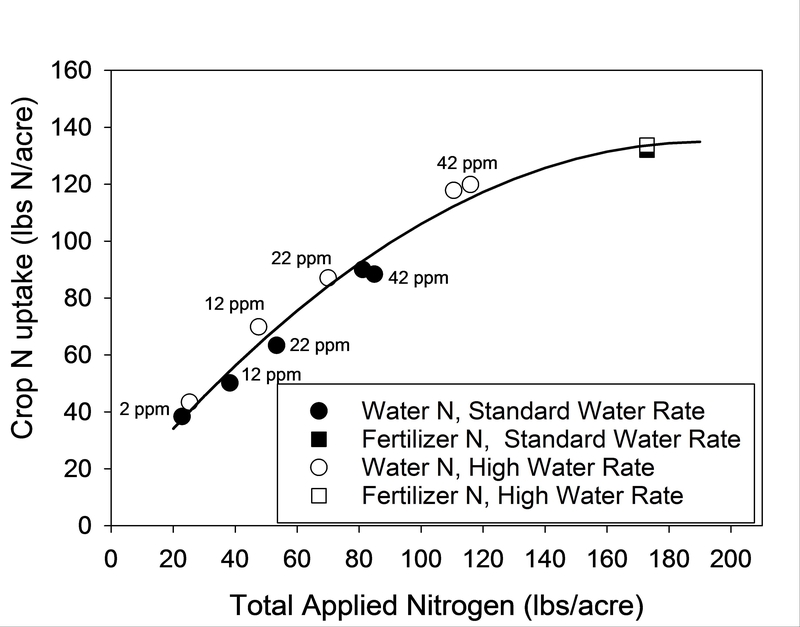 Nitrates in the water can also be a significant source of nitrogen for your crops. We will offer a hands-on training to learn in depth about the features of CropManage, a free decision support tool for water and nitrogen management of coastal crops. In addition to head and romaine lettuce, CropManage now supports broccoli, cauliflower, cabbage, and strawberries. Nitrate test strips are an affordable tool for quickly measuring nitrate (NO3) in soil and water, and can help farmers and crop advisers adjust fertilizer inputs to match the nitrogen (N) needs of various types of crops. There are now a variety of brands of nitrate test strips available, many of which are manufactured for testing the quality of aquarium water, but may also be suitable for soil testing. All of the brands of test strips are used in a similar fashion: the strip is briefly dipped into an extractant solution (for soil) or in water, and allowed to develop color during a standard interval of time, usually ranging between 30 and 60 seconds. After color develops on the strip, a color chart, calibrated to either parts per million (ppm) of NO3 or expressed in ppm equivalents of nitrogen (NO3-N), is used to determine the NO3 concentration of the sample. Multiplying Nitrate-N concentration by a factor of 4.43 converts the reading to NO3 concentration. Because the strips may continue to develop color with time, it is important to always read the strips at a standard time interval, or the measurements will not be accurate or repeatable. More detailed information on using the nitrate test strips for monitoring soil nitrate levels was presented in several of our past bulletins, newsletters, and blogs. Depending on the soil type and crop nutrient requirements, vegetable farmers need test strips that are accurate for soil NO3-N concentrations ranging between from 5 to 30 ppm, which would roughly correspond to a range of 10 to 60 ppm of NO3 in the nitrate quick test extract solution. For strawberry production, and other crops that have a slower N uptake rate than vegetables, growers need test strips that are accurate over a narrower range of soil NO3 concentrations (5 to 15 ppm NO3-N in soil). Past studies have demonstrated that the Merckoquant test strip are accurate for measuring soil NO3-N in the range of 10 to 40 ppm. Because more brands of test strips have become commercially available in recent years with varying ranges of sensitivity, and the need to identify test strips that are accurate for measuring low concentrations of soil NO3-N (0 to 15 ppm), we evaluated the accuracy and ease of using six commercially available brands of test strips over a range of nitrate concentrations found in commercial agricultural fields. A stock solution of a known NO3 concentration was prepared by dissolving a measured weight of sodium nitrate (NaNO3) into 1 liter of distilled water. 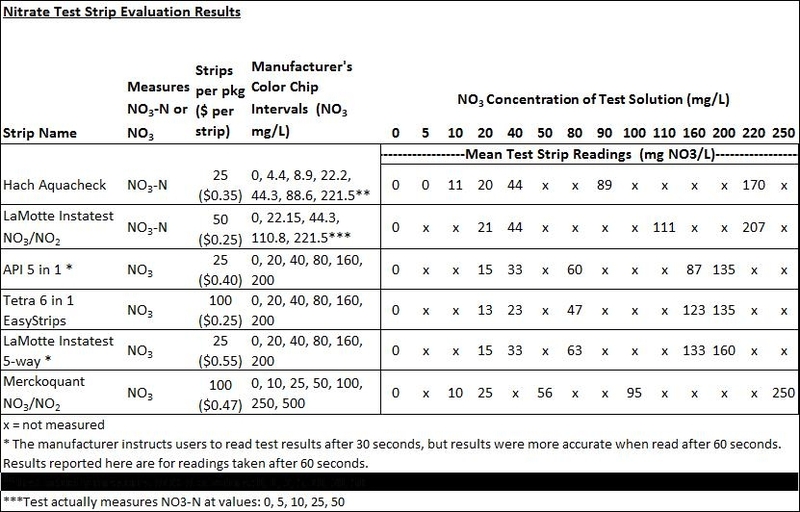 This stock solution was further dilluted with distilled water to standard nitrate concentrations that matched the values of the color chips of the various test strips evaluated in this study. The NO3 concentration of each standard solution was confirmed by spectrophotometric analysis. Each brand of strip was evaluated at NO3 concentrations corresponding to the color chips provided by the manufacturer. The Hach Aquacheck and Lamotte Instatest NO3/NO2 strips differed from the other brands because the color chips were calibrated in equivalents of NO3-N rather than NO3. For convenience of displaying and comparing the data, results for these two brands were converted to NO3 (by multiplying the NO3-N values by 4.43). The Merckoquant NO3/NO2 test strip was the brand originally tested by UC Cooperative Extension for use with the soil nitrate quick test, and was considered the standard in this evaluation. This strip measures to a maximum of 500 ppm NO3, but was only evaluated up to 250 ppm NO3 (56 ppm NO3-N) for this test. Each brand of test strip was evaluated 4 times for each standard NO3 solution corresponding to the manufacturer's chip color chart. The procedure that we followed to determine NO3 concentration was to dip the strip briefly in solution, and hold it horizontally after removing it, allowing color to develop for the interval specified by the manufacturer. Most strip manufacturers recommended a 1-minute time interval between wetting and reading the strip color. The manufacturer for API 5-in-1 and LaMotte Instatest 5-Way recommended reading test strips after 30 seconds, but results appeared to be more accurate after a 60 second interval, therefore all results reported for these strips are from readings taken 60 seconds after placing the strip in the test solution. After waiting the specified interval, the color of the test strip was compared to the color chips provided by the manufacturer. If the test strip color matched one of the chips, then the value of the chip was recorded. In many cases, the color of the test strip was between 2 of the standard chips, and in these cases an estimate was made based on comparing the intensity of the color development with the 2 closest matching chips. Because this method relies on visual observations, all tests were made in a room with ample lighting and by one observer. The mean NO3 values measured using different brands of test strips were compared to the standard solution values in Table 1. Some brands of test strips appeared to be accurate at specific ranges of NO3 concentration. The Merckoquant NO3/NO2 brand was the most accurate for the full range of NO3 concentrations (Table 1). The next most accurate brand over the entire range of NO3 concentrations evaluated was the LaMotte Instatest NO3/NO2. The Hach Aquacheck was accurate for the range of 10 to 90 ppm NO3 but measured NO3 lower than the standard solutions at concentrations above 100 ppm NO3. The remaining brands of test strips, LaMotte Instatest 5-way, API 5 in 1, Tetra 6 in 1 Easystrips, all measured less NO3 than the standard solutions over the range of 20 to 200 ppm NO3. These strip brands should probably not be used for the soil nitrate quick test and for assessing nitrate concentration in irrigation water. Although the LaMotte Instatest NO3/NO2 also had good accuracy across the range of 20 ppm to 220 ppm NO3, it did not have a standard color chip for evaluating NO3 at low concentrations, and therefore may not be suitable for strawberries and other crops where soil nitrate is typically in the 5 to 15 ppm NO3-N range. Both the Merckoquant and Hach brands were accurate for measuring NO3 at low concentrations (10 to 40 ppm). Although the Hach Aquacheck strip had a color standard of 5 ppm NO3, the strip was not able to measure NO3 at a concentration below 10 ppm (Table 1). With the exception of the Merckoquant NO3/NO2, all test strips were purchased online through Amazon.com. The price reported for the strips in Table 1 was the purchase price advertised at the time our study was conducted (January 2014). Some strips were available in larger quantities or from other vendors, for different prices. The Merckoquant NO3/NO2 can be purchased from Cole-Parmer (http://www.coleparmer.com) or at EMD Millipore (http://www.emdmillipore.com). We identified 3 brands of test strips that accurately measured NO3 and can be used to quickly assess the concentration of NO3 in soil or water. Both the Merckoquant NO3/NO2and the Hach Aquacheck strips were accurate for measuring concentrations of NO3 as low as 10 ppm, which would roughly correspond to 5 ppm NO3-N in soil. No brand of test strip measured NO3 accurately below 10 ppm. Several brands of strips that measure NO3 in addition to other constituents in water were found to under estimate NO3 concentration, especially at high values. While laboratory analysis of NO3 is generally more accurate than using colorimetric test strips, the strips tested in this study appear to be sufficiently accurate to estimate the level of residual mineral N in soil samples and for determining the NO3 contribution from irrigation water, and should be useful for quickly assessing soil N status before making a fertilizer decision. Table 1. Comparison of nitrate-test strip and standard solution values. An important benefit of drip irrigation is the ability to apply fertilizer through the irrigation water, permitting growers to spoon-feed nutrients, such as nitrogen (N), to their crops. By avoiding applications of large amounts of N fertilizer when the crop is small and uptake rates are low, losses of nitrogen by leaching can be minimized. Also, unlike furrow and overhead sprinklers, drip can deliver fertilizer in the zone where roots are most concentrated. While drip fertigation offers several advantages for managing nitrogen fertilizer during the season, success depends on the management of the drip system and using best practices for fertigation. Drip systems with poor distribution uniformity may likely cause fertilizer to be unevenly distributed within a field. Also, the strategy of injecting fertilizer into a drip system can affect the distribution of fertilizer to the crop. Proper fertigation requires injecting at a steady rate and at a location that provides sufficient mixing of fertilizer with irrigation water. To assure that the fertilizer uniformly distributes within the field after an injection, sufficient irrigation time with clean water is needed so that all of the fertilizer is flushed out of the drip tape before the irrigation ends. For drip to be economical for vegetable growers on the central coast, most farming operations retrieve drip tape after each crop is harvested and repair and reuse the tape for 8 to 12 crops. 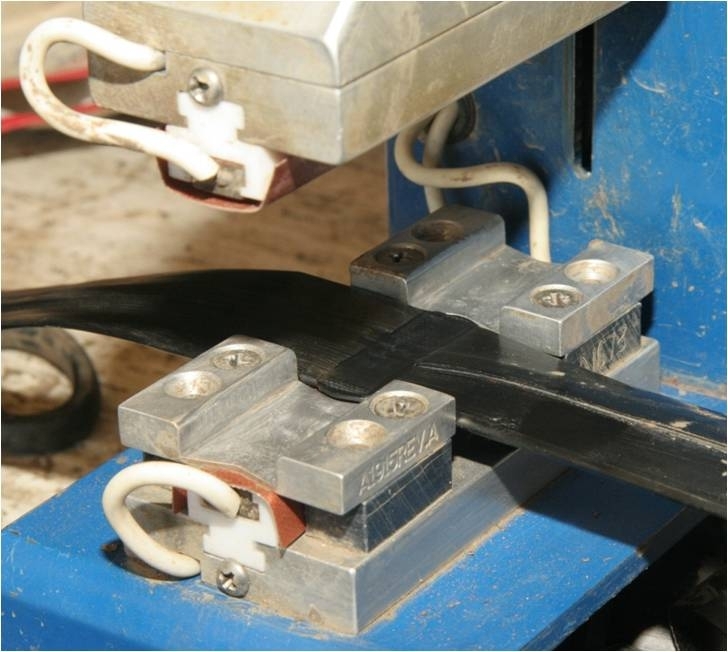 Breaks and leaks in the tape are repaired using a splicing machine (Figure 1). Growers have expressed concern that fertigating through their drip systems is not resulting in even applications of N fertilizer after the tape has been reused for multiple crops. Splicing machines often do not fully repair leaks in tape, and emitters tend to plug over time unless the tape was adequately maintained by flushing and chemical treatment. In response to grower concerns, we evaluated the uniformity of applied water and nitrogen fertilizer for surface placed drip in 11 commercial lettuce fields during the fall of 2012 and during the spring of 2013. All fields were planted with romaine or iceberg lettuce varieties on 40-inch or 80-inch wide beds. At each site irrigation, pressure, and fertilizer uniformity were evaluated during a single irrigation event. Field sizes ranged from 8 to 20 acres, and the maximum row lengths ranged from 600 to 1340 ft. Drip tape at all field sites was 7/8 inch diameter, medium flow tape (0.34 gpm/100 ft), but varied by manufacturer and age. The location where fertilizer was injected into the irrigation system, and start and end time of the fertigation, as well as the duration of the irrigation, were recorded. Before irrigating, couplers fitted with ¼ gallon per hour pressure compensating emitters that were spliced in to the drip tape at 24 locations within the field, representing the head, tail and middle areas. Water from these emitters was collected into 5 gallon containers during the entire irrigation (Figure 2) and analyzed for NO3-N and NH4-N. The discharge rate of 4 emitters and pressure of the tape was measured near each of the 24 fertilizer sampling locations (total of 96 emitters). Mass (lbs) of N applied at each of the 24 collection locations within a field was estimated by multiplying the measured discharge rate of the drip tape by the irrigation time and by the concentration of N in the collected water. Uniformity of applied water, tape pressure, and fertilizer was calculated by comparing the lowest 25% of measurements to the average of all 24 measurements. In addition to evaluating fertilizer distribution uniformity, we evaluated the time for fertilizer to travel to the furthest distance from the injection point by injecting food dye for a 5 minute period into the irrigation system and monitoring the water for color at the furthest point from the injection location. Fig. 2. Low flow (1/4 gph) pressure compensating drip emitters were used to collect samples of irrigation water during the entire irrigation cycle. Distribution uniformity of applied water for the 11 fields averaged 73% and ranged from 38% to 88% (Table 1). The industry standard for irrigation uniformity of surface drip is 85%. 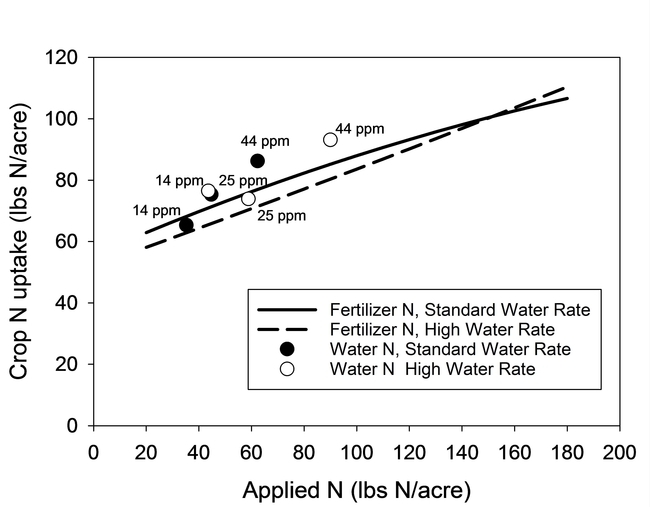 Fertilizer application uniformity averaged 67% and ranged from 46% to 82%. The distribution uniformity of the drip systems of 7 fields evaluated was greater than 74% (avg = 82%) and fertilizer uniformity was greater than 72% (avg = 77%) (Figure 3). One of the causes for poor distribution uniformity of some drip systems may have been related to pressure. Pressure uniformity averaged 80% and ranged from 43% to 99% (Table 1). 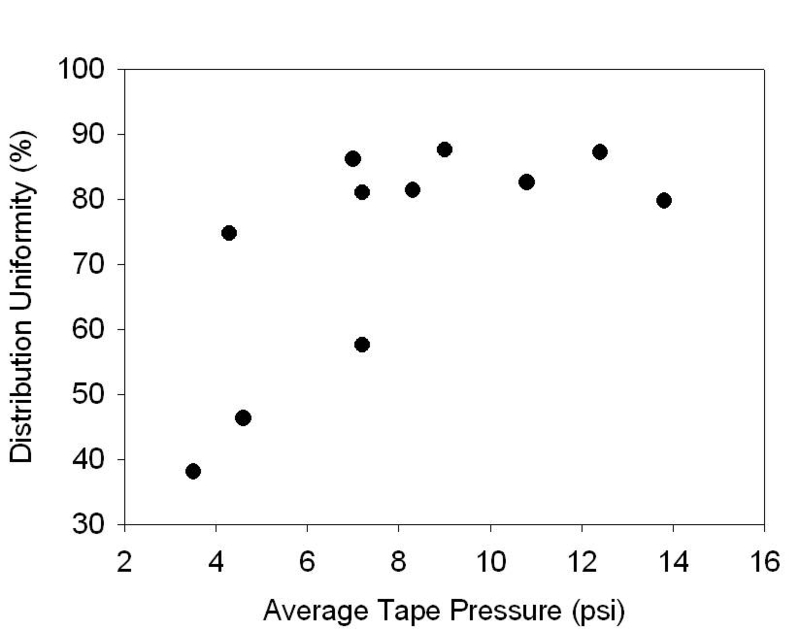 Average pressures in the drip tape ranged from 3.5 to 13.8 psi (Table 2). Where the system pressure averaged 4.3 psi, the tape discharge rate was 30% less than the manufacturer's rating. 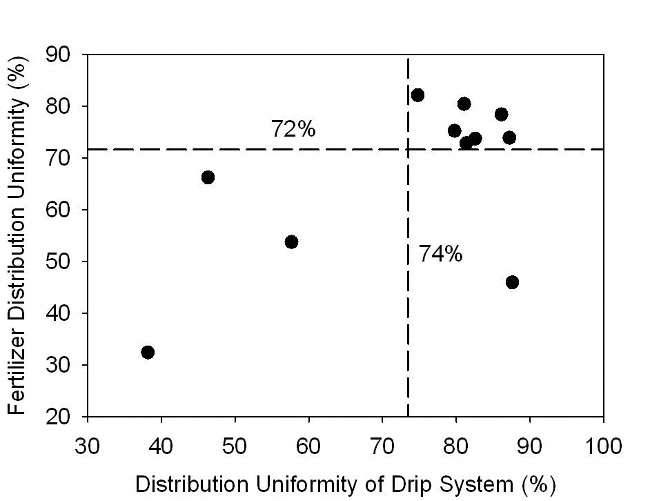 Irrigation distribution uniformity decreased substantially when the average field pressure was less than 5 psi (Figure 4). Additionally, a substantial percentage of emitters of some drip systems were plugged (Table 2) which would reduce irrigation system uniformity. Leaks were evaluated in 5 fields and ranged from 1 to 5 leaks per 1000 ft of tape (Table 2). Significant leaks can potentially reduce drip uniformity by lowering the downstream pressure. Other limitations to good drip uniformity included mixing different types of tape in the same field, fluctuating pressure during the irrigation, and row lengths longer than 800 ft.
Field 8 had a high uniformity of pressure and irrigation distribution but a low fertilizer uniformity. We speculate that the fertilizer which was injected at a “T” connecting the valve in the field with the submain did not have sufficient time to mix with the irrigation water before the flow split into opposite directions. Hence, the average concentration of N on one side of the field was approximately half the concentration measured on the other side of the field. The distribution uniformity of fertilizer on individual sides of the fields was greater than 87%. With the exception of field 8, fertilizer distribution uniformity was closely related with irrigation system uniformity (Figure 4). Fields with the lowest fertilizer uniformity were operated at the lowest average pressure and/or had the highest level of plugged emitters (Table 2). Fertilizer was injected at the well in 4 of the fields and at the submain valve in the other 7 fields (Table 3). Injections were made simultaneously using 2 valves at 3 of the fields. Fertilizer was injected during an average of less than 30 minute period often at the beginning of the irrigation (Table 3). The time required for the fertilizer to travel to the furthest point of the irrigation system averaged 42 minutes but ranged from as short as 22 minutes to as long as 1 hour. Field size, row length, and injection location appeared to affect the travel time of the fertilizer. The average time for flushing the fertilizer was 3.75 hours, which was ample time to allow the fertilizer to completely flush from the system. The irrigation industry recommends that for long irrigations (> 4 hours), fertilizer should be applied in the middle of the irrigation cycle. Only at field 10 was the fertilizer applied during the middle of the irrigation. The long flush time after injecting could potential leach nitrate forms of fertilizer below the root zone of the crop. On average, half of the applied fertilizer N measured in the collection buckets was in the nitrate form. This survey of commercial lettuce fields demonstrated that N fertilizer applied by drip has an average distribution uniformity of 77% when the injection is properly made and the drip system is operated and maintained to achieve an average distribution uniformity of 82%. The results also showed that N fertilizer applied by drip is frequently distributed to fields unevenly due to poor uniformity of the drip systems, or because proper injection procedures were not followed. Operation procedures observed at these sites would suggest that irrigators may need training to better understand the principles of fertigation so that fertilizer is applied at the highest uniformity possible, and in a manner that will prevent leaching losses of nitrate. We thank the California Leafy Green Research Board for funding this project and the many growers that cooperated with the field trials. Table 1. 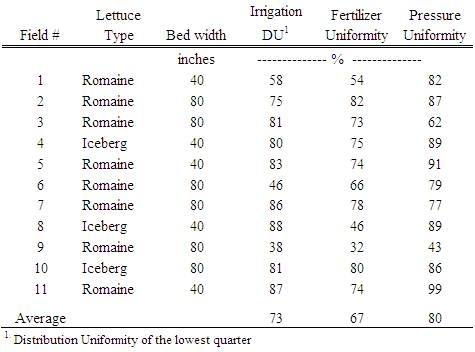 Summary of irrigation, fertilizer, and pressure uniformity of drip irrigated lettuce fields. Table 2. Drip tape characteristics at commercial lettuce sites. Table 3. Irrigation summary for drip irrigated lettuce fields. Fig. 3. Relationship between distribution uniformity of retrievable drip systems and fertigation uniformity. Each symbol denotes a commercial lettuce field evaluated during the study. Fig. 4. 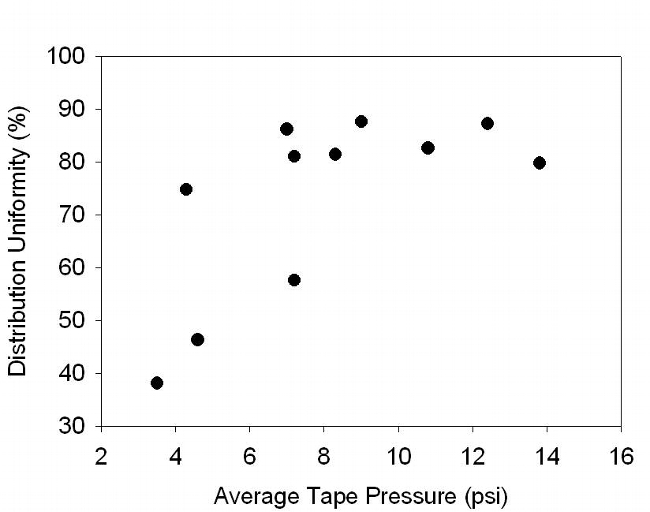 Effect of tape pressure on the distribution uniformity of retrievable drip systems. Each symbol denotes a commercial lettuce field.